Location: Should I potty my baby in the same place every time? A: Hey Sarah! I’m glad that you asked this question…it comes up a lot for a variety of reasons. At 3 1/2 months, your baby still doesn’t have the (brain) capacity to maintain long term, repetitive tasks/thoughts/processes (this happens for the short term memory at around 6-9 months, long term around 14-18 months). It might seem like she’s consistently doing new things…which is right, because she’s learning new skills all the time. But, the brain isn’t quite “there” yet at this age. A long way of saying that you don’t need to worry about place just yet. However, your hunch is right about eventually needing to begin to potty her in a consistent place. At the age your gal begins to crawl, it might be a good idea to start exclusively pottying her in the bathroom. The exception to this would be if you’re hanging in the living room a lot and the bathroom is too far away for your baby to hold it that long. In that case, you’d also have a potty available in the living room. Also, if you should ever need to do a naked day to re-learn her timing or signals, or to teach her the motion of “going towards the potty” by placing her on there for each pee, then you’d want the potty nearby (obviously). For nighttime at 3.5 months, keep pottying her where it’s least disruptive for you. IF she should begin to fuss about it, it might be an indication that she knows she’s peeing over the bed and would like to do it in the proper place (the bathroom). In this case, put a dim nightlight in the bathroom and potty her over the sink at those times, at that age. Nighttime EC shifts so often that this advice isn’t really applicable to every baby at these ages…but these are some things to keep in mind, anyway! Keep pottying her wherever convenient and sensible while she’s young. When she hits crawling, begin exclusively pottying her in the bathroom (whether in-arms or on the mini potty or toilet set reducer…or in dire situations or pauses, on the floor). At nighttime, do what’s least disruptive (if anything) and note if she shifts to wanting to potty elsewhere in the wee hours. Thanks for your question, Sarah! I hope it helped some other ECers know what to do when practicing Elimination Communication in multiple locations, with multiple receptacles. I’d love to know your home potty station set-up(s). What do you do at your casa? Please write them in the comments below. Potty Time Master: a MiniCourse that helps you get extremely good at detecting the 4 ways to know the baby has to pee. Go Diaper Free: my popular EC book that simplifies EC, beginning to end. I’m doing part time potting with my 3 month old (pretty much just the easy catches and I don’t worry much when I miss) and I’ve just got one potty so I’m keeping it at our changing station. IT’s working for me because it makes it easy to offer the potty whenever I’m changing a diaper and easy to empty and clean out the potty without worrying about her being on her own since the changing station is on the floor right next to our ensuite bathroom. 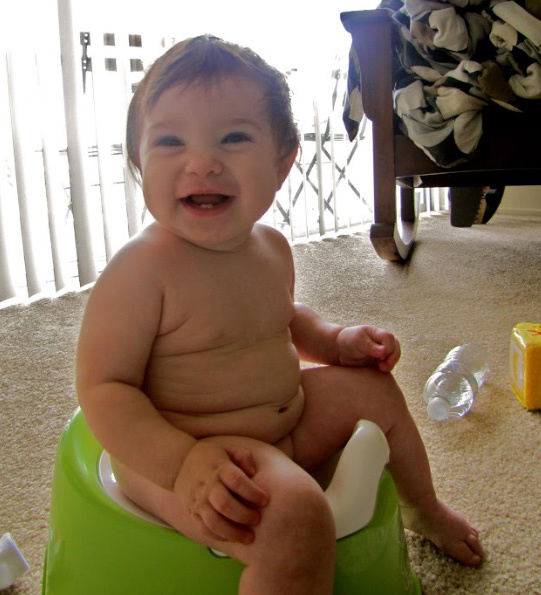 When my oldest was potty training we had a mini potty in the living room and another in our family room. It might have looked odd to visitors but it meant she could get to the potty whenever she wanted or needed to and I think that independence helped her along. Blessings for a wonderful birth to you and Twyla! We keep a potty in the living room and another in my son’s bedroom which he uses when he first wakes up in the morning. My almost 21 month old daughter doesn’t seem interested in using the potty. I fear I pushed the subject too soon (around 12 months), she used the potty a couple of times then almost seemed afraid of it. I dropped the matter but left the pottys in the bathroom, occasionally asking if she wanted to use them. I’m finding it difficult to find to find the line between encouraging and pushing. Any suggestions? Hope you are meeting Twyla soon! I’m actually getting ready to ditch diapers with my 13-month old. We used to have a potty station in the living room when she was young, but we’ve been pottying her almost exclusively in the bathroom for several months now. We are coming out of a long pause that involved learning to walk. Now she just seems resistant because she wants to do it herself. I’m teaching her independent skills while I wait for Thanksgiving travel to end, and then we’ll ditch diapers. She likes to hide in one particular corner usually to poop, so I was considering putting a potty station there since that seems to be where she feels the most privacy. But I’m worried I’ll be teaching her to go to the bathroom in the living room, especially since she tends to just stand up off of the pott and run. I worry also though that she’ll be reluctant to use the bathroom with our seat reducer because I have to help her in there. How can I set up the most effective potty stations for the initial ditching of diapers? PS – location at this age truly doesn’t matter. Instincts for more privacy will begin to kick in and she will not be conditioned to go in the living room! If you feel better about it, give a mini potty option IN the bathroom and close and lock the door with both of you in it when you feel she needs full control. Bottoms off. Turn your back and be “busy.” See what happens! It definitely changes by age. For my 3 month old, we are super part time, mostly doing easy catches and no night time, so I keep a mini potty in the living room and potty him immediately after nursing and during diaper change. My two year old will only use the little potty or the mini frog urinal in the bathroom. Thanks for the information Andrea! I am due on Monday with my second! Midwife thought I would have the baby a few weeks ago but still hanging in there, we can’t wait! I did EC starting at about 3 months with my first and took her to the potty everywhere since we were always out and about. Good to keep in mind developing a consistent place at home when baby gets older. I had a question, with my first when I was out and about I would take her to the bathroom if I could or if we were at the park I would just hold her beside me or between my legs off to the side on the grass. Was so simple and easy and somehow she never pooped whenever I did that!?? For this kiddo I am thinking through what happens if we are out and about and baby has to pee/ poop and there is no bathroom. I have the top hat potty on my registry but am trying to figure out logistically how I can function with it out and about. So if baby pees in potty do you just toss it out on the grass? And if baby poops do you go to the nearest bathroom and put it in the potty and the rinse it in the sink? And do you have a bag for it in your diaper bag just in case it’s wet? Just processing through what it will really look like rove out and about and do it when I don’t have the same flexibility as I did with one kid. Thanks!!! Good vibes and well wishes for a safe delivery for Twyla!! Thank you so much, Jerusha!!!! I have a 2yo daughter who goes where she wants (so either on the “big” toilet, with or without the seat reducer – we have a stool so she can climb up by herself-, or the toddler potty in the living room). She’s very independent and goes when she wants and where she wants. She’s been diaper-free since 18 months (almost a year now!) With my son, he’s almost 7 months, I have only put him on the toddler potty a handful of times. I struggled with postpartum depression for a few months and really haven’t done EC like I did with my daughter. I started her at 8 weeks. But I am wanting to be diaper-free with my son between 12 and 18 months. Thanks for the great info! I potty my 3 mo old in the sink but need a kid potty soon, as he is getting too heavy and squirmy. We stopped trying to EC at night because it was so disruptive for him, even though he gets restless in the morning around 5 from having to go pee. We still swaddle him in a Halo wrap because he sometimes won’t stop rubbing/scratching his eyes when he’s tired, to the point of making himself cry. So pulling the velco off, unbuttoning his onsie and then pulling his disposable off wakes him up entirely and we spend another hour trying to put him back to sleep. Not sure how to get around this until we stop swaddling. Anyone else have this problem? We just transitioned our 19th month to using the potty only in the bathroom. We used to have a potty in 3 or 4 different places around the house. As his pees consolidated and he got better at holding, we moved down to just 2 potties. He has been diaper-free during while awake for a couple of months now and is better at independently staying focused on the pottying task. So we ditched the potty in our main room (where I could more easily supervise while accomplishing other things) and the transition went well. I found out about EC when my daughter was 11mth old and have been doing only daytime pottying….she is now 14.5mths and this is what we do…. We have one on her bedroom next to the change table (looking out the window…being able to look around outside at the birdies helps her stay seated that little bit longer haha) which seems to be the best for us….and after use she helps me “toddle” to the bathroom nextdoor to empty it. We also have a potty in the back if our car which we use when out…(I think she likes the view best form there haha)…this has been a success too…but catching a poo in the car has been interesting…if near a toilet I empty it in there if not I have toilet paper and my cloth nappy bag to work with haha. Our bathroom is so small there is no place to put the potty on the floor. I used to hold my son over the toilet in EC position in my arms, but now he’s 1 and doesn’t like it so much anymore. He prefers the potty, so I put it outside the bathroom door when I think he has to go poo and for pees, he goes mostly over the kitchen sink because, I don’t know why, he doesn’t like the bathroom sink anymore. I hope you have a safe and healthy delivery soon! I think I need to start taking him to the bathroom though as he’s just had a pause. I did a reset by putting him back in cloth nappies for 4 days and he finally started walking. In hindsight I put him into day undies at entirely the wrong time as I realised a couple of days later that he was trying to cut 6 teeth and try to walk and I removed the nappies! Oops! This is a great article, and awesome responses! Every child/situation is different. We started PT EC at 4 mos. We had a toilet reducer and I would hold him on the toilet reducer until he could sit up on his own. Our counter was large enough that I used it as our “diaper changing station”. Essentially, if I thought he might need to potty or noticed he was already wet, I would take him in the bathroom, remove his diaper and set him on the toilet. Sometimes he would go, sometimes he wouldn’t, but I wanted to establish the routine/correlation between bathroom and elimination. Once we removed diapers, I kept a floor potty close by in whatever room we were in so we could catch pees at a moment’s notice. We only have 1 bathroom, so if it’s going to be occupied for a long time, we set the floor potty outside the door so that he has access if necessary. Our next step to independence is ditching the floor potty and getting him back to the big toilet. Thanks for sharing yours, and your plans for the future. Sounds solid. We keep a potty in the family room tucked on the lower shelf of an end table. It’s easy reach from my nursing chair. That works well as the older children know just where it is and not to knock it over (I don’t always dump after every pee, but after each poop). I just realized that my little man was cold and that’s why I kept missing… so I put him in undies and pants rather than the cloth diaper/no cover, and now he’s happier and holds it longer. He’s almost 8 months old. Best to you and sending prayers for a beautiful birth! When we did EC then we had a potty in whatever room we spent a long time in (especially if she was just wearing undies or of she was wearing a diaper with no cover. So if I was cooking then we had one in the corner of the kitchen, if we were in the living room then we had one in there and so on. I think we did this until she was about 9 months old. She had started walking then and the only other place we had a potty besides the toilet was in her room for convenient pottying during the night. I had planned on starting EC immediately after birth and I did some (potty before changing into a new diaper) during the first 6 days while we were still at the hospital (I had trouble walking and even getting out of bed required assistance) but then after we met with a doctor that said my babys hips were popping out of place and she needed to wear what I called a “taco shell” (because that is what it looked like) for 6 weeks. Which meant that EC was out of the question until she reached around 8 weeks. Then we started again! I’m excited about Twyla and your “no diapers at all”! I’m due in May and I will be following your documentation closely! Sooo excited! Anyway, my second is in childcare for 5 days a week with cloth diapers and I still try to go with him every day to the toilet. He seems to be comfortable, babbles a lot and makes his wee if he has to on the toilet. In rare cases I get the right moment for his poo. Still, we’d like to get rid of those diapers, as he gets more and more inpatient with nappychanging and if he’s refusing on holding still for the new nappy, we go and put him on the toilet. Eitherway, if he had a busines on it or not, afterwards he doesn’t mind having put clothes or diapers on again. This seems to me a pretty clear way of him telling me that he wants to be “all grown up”, right? So how can I help him achieve that and more important how can we work toghether with him and recognize his signs and get the childcare into it as well? Please excuse my sometimes bumpy English, its’ not my first language and also for the long writing. I hope it’s not too much for you and I wish you all the best and hopefully a good birth. Hi Lucy! No worries at all. I totally understand you. Regarding childcare it’s great that you have him in cloth diapers. When he is poop-reliable, you can begin sending him in cloth training pants. See my blog post on this topic here – https://godiaperfree.com/how-to-send-your-young-toddler-to-preschool-without-diapers-daycare/ – and hopefully they will help! As far as his signs it sounds like what you’re doing – taking him at good transition times – is working. If you want to get better at knowing when to take him to the potty, my ec book covers this – https://godiaperfree.com/the book – and I also have a minicourse on Potty Time (knowing when to take baby) that is a deeper dive into the topic – https://godiaperfree.com/minicourses/pottytime – lots of resources! Hope they help! !